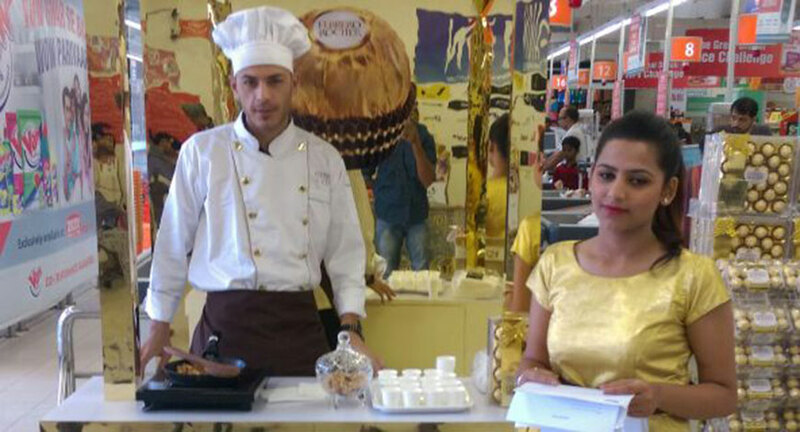 During Diwali, Vibgyor Brand Services helped promote Ferrero Rocher a premium, spherical chocolate sweet produced by the Italian chocolatier Ferrero SpA. Ferrero Rocher was created from a long family tradition and expertise in crafting chocolate and quality confections. From the toasting of the hazelnuts to the making of the chocolate, Ferrero owns unequalled expertise in the creation of the inimitable Ferrero Rocher recipe. Vibgyor Brand Servicess managed and executed the promotion of the product in the most unique way. At the MTO, a foreign chef roasted the hazelnuts that is put inside the chocolate and sampled it to the customers. The activity was conducted in Mumbai, Bangalore and Delhi over 3 weekends from 14th – 29th October 2016. In over 72 man-days execution, over 20,000 people were targeted across 28 outlets in 3 cities.